Circle City Tickets has you covered! 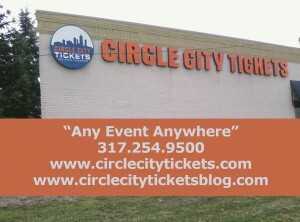 We caught up with the owner of Circle City Tickets to learn a little bit more about this company. When did you launch Circle City Tickets? Circle City Tickets as it is today started in July 2001. We are a product of a merger of two companies, Court Side Tickets & Circle City Tickets. Both companies started in the mid 80’s. The principles have been in the business for over 20 years. 3 of the four principles started the business at Indiana University in Bloomington Indiana as a way to make some extra money and to pay for school. Best selling ticket(s) to date? Best selling ticket this year would be the run of Wicked at the Murat theater. What are you predicting will be your hottest tickets this summer….fall? The upcoming US Senior PGA Open and the upcoming Colts season look to be good tickets this year. We try to offer exclusive deals to Text club members only as well as informative texts about current and upcoming events. Only Standard Messaging Rates Apply! Anything else you want to share about your company? We have been located in the Indianapolis area since 1986 and have supported many charities in that time. We pride ourselves on being good stewards for the community and reasonable business leaders.